The first solo CD by Ramon Lopez on Leo Records was an instant success (Eleven Drums Songs, LeoLab 044). It was in the top ten CDs of the year by almost every writer in France. 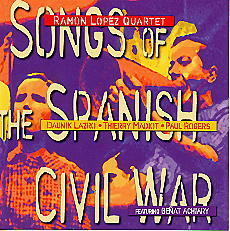 But for this, his next project, Songs of the Spanish Civil War, Ramon Lopez put together a quartet of heavyweights: Paul Rogers on bass, Daunik Lazro on reeds, Thierry Madiot on bass trombone, and a special guest - Benat Achiary - who puts vocals to three songs. The first analogy is, of course, with Charlie Haden's Liberation Music Orchestra, but the musical language is, of course, newer and stronger.